Derek Carr will be in an Oakland Raiders jersey this upcoming NFL season, according to head coach Jon Gruden. Oakland reportedly had been shopping around the 27-year-old Carr at the NFL combine earlier this month. Gruden, however, said that was not the case as he addressed the speculation on Monday. "He's going to be our quarterback," Gruden told the NFL Network. "I'm not going to address all the rumours. I could not care less about the rumours. … I've got a lot of confidence in Carr." Carr completed 68.9 per cent of his passes and threw for 19 touchdowns, along with 10 interceptions, on a Raiders team that struggled in 2018. "We've established a really good work ethic in our building. Our guys know how to prepare, how to practice. We've got a good environment." Oakland, however, have made major upgrades to their offense, including trading for disgruntled Pittsburgh Steelers receiver Antonio Brown as well as signing wideout Tyrell Williams and offensive lineman Trent Brown. 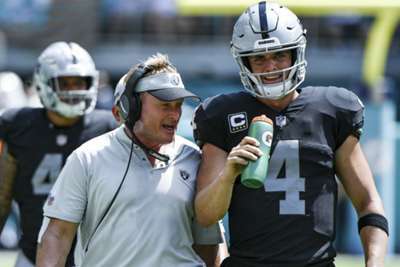 "I'm excited about Carr [and] what he can do with Antonio Brown, with Tyrell Williams, with Trent Brown coming in here," Gruden said. Gruden said Brown — a seven-time Pro Bowl player with Pittsburgh — is "exactly what" the team need. Gruden left the broadcast booth and signed a 10-year, $100million contract with the Raiders in January 2018. Oakland finished with a 4-12 record during the 55-year-old's first season with the team.